36" inch length of flowing, beautiful chainette fringe, sold by the yard. 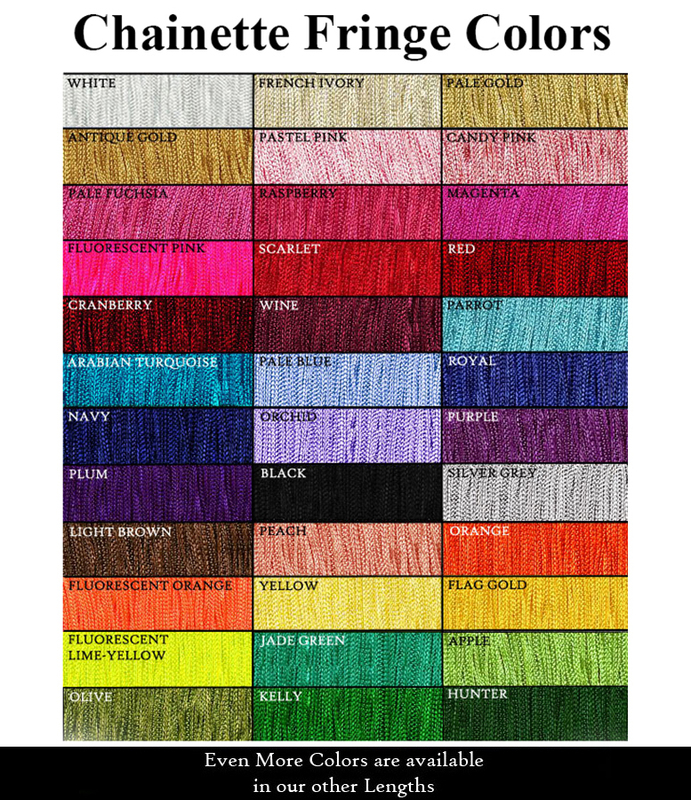 The 36 inch long solid color chainette fringe is $49.75 per yard and comes in 33 colors. The 3 Fluorescent colors are $63.75 a yard. This beautiful silky rayon chainette dance fringe trim is offered in a large variety of other lengths as well. View other lengths. In order to match a particular color, you can order samples. This fringe is perfect for dance fringe, outfits, costumes, cheerleader uniforms, evening gowns, dresses, home decor, wedding and party decoration. We encourage you to order color samples of our chainette fringe trim before purchasing if you are trying to match an exact color. Click here to order Samples. This chainette trim is perfect to embellish dresses, dance costumes, flapper dresses & performance competition outfits. Antique Gold Fringe Trim is a true antique (muted) gold, a little richer and deeper in color than our "Pale Gold". This is a beautiful and traditional color! Apple Fringe Trim is a rich yellow/lime/green, a perfect apple green chainette. Arabian Turquoise Chainette is a deep and rich jewel-tone turquoise blue. If you need a green based turquoise, our "Jade" is a turquoise green. Black Chainette Fringe Trim is a true,black shade of black chainette fringe. Perfect for a black flapper dress. Candy Pink Chainette Fringe Trim is a soft feminine pale pink that is not quite as pale a pink as our "Pastel Pink" chainette though. Cranberry Fringe Trim is a rich burgundy chainette, with cool undertones of color. Flag Gold Fringe is a vibrant golden yellow chainette. The color of dance fringe on the uniforms of marching bands and banners. Fluorescent Lime Yellow Fringe Trim is a bright neon yellow lime. Fluorescent Orange Chainette Fringe is a beautiful neon orange chainette fringe trim. Fluorescent Pink is a fluorescent chainette in perfect bright pink chainette. French Ivory Chainette is the absolutely perfect pale ivory without any yellow undertones. Kelly fringe trim is a grass green chainette. It's also the color you think of when you think of the green associated with Ireland. Hunter is in a traditional dark hunter green. This is a shade of very deep green. Jade Fringe Trim is a rich jewel tone shade of turquoise green. If you're looking for a turquoise blue, look at "Arabian Turquoise" which is a blue turquoise. Light Brown Chainette is a gorgeous shade of brown! Not too light and not too dark. Rich and full of life. Magenta Chainette, a deep vibrant shade of rose red dance fringe with a touch of a cool purple undertone. Navy Chainette is the perfect dark navy blue chainette fringe. Rich, deep color! Olive fringe trim is a vibrant true shade of olive green. Orange Chainette Fringe is a beautiful, beautiful shade of true orange. Orchid, a soft orchid fringe with a touch of silver undertones. A very elegant color! Pale Blue Fringe Trim is a soft true baby blue. Pale Fuchsia Fringe Trim is a beautiful shade of soft fuchsia. If you need a richer, darker shade of fuchsia, then our "Raspberry"
Pale Gold Chainette is a pale antique gold. Very soft and muted shade of light spun gold. Very popular! Parrot is a bright jewel-tone turquoise with undertones of blue. Pastel Pink is a soft pale, pale pink. This is our palest pink chainette fringe. Peach fringe trim is a stunning shade of pale soft peach. Almost a silvery peach. Plum is a bright, rich shade of deep purple chainette. If you need a lighter shade look at our "Purple". Purple Chainette is a medium purple - lighter than our "Plum". If you need a darker purple, our "Plum" is darker. Raspberry fringe trim is a striking shade of raspberry pink. We love, love, love this color! Red Chainette is in a deep true red chainette - a traditional red. If you need a slightly lighter shade of red, go with "Scarlet". Royal, the perfect bright royal blue chainette fringe trim. Scarlet is a crayon red shade, lighter in color than our "Red Chainette". If you are looking for a deep traditional red, than take a look at our "Red". Silver Grey is an effervescent silver gray and is very, very elegant. White Chainette is a pure silky pure white chainette fringe. A true white! Wine is in a rich burgundy color with a little bit of a Merlot colored undertone. It is very close to the color of Merlot wine. Yellow Fringe Trim is a jewel tone lemon yellow. It is a true rich yellow without any golden undertones. Black with Black Sequins: a true black chainette fringe with sparkling solid black sequins. Elegant! Fluorescent Lime with Lime Sequins: This chainette almost exactly matches our Apple color chainette, except this has stunning iridescent lime sequins. Magenta with Fuchsia Sequins: This Sequin trim is a vibrant shade of rose-red-fuchsia with bright and sparkling fuchsia sequins. Orchid with Iridescent Sequins: This is a beautiful silvery lilac chainette that has iridescent sequins throughout that sparkle light and color. Gold with Gold Sequins: A very sophisticated sequin chainette. The pale gold is an elegant soft shade of gold with gold sequins. Pale Pink with Iridescent Sequins: This is the softest and most feminine trim! Pale pink chainette has strands of iridescent sequins that sparkle like diamonds. Plum with Iridescent Sequins: A rich purple chainette (matches our Plum chainette) with iridescent sequins. Red with Red Sequins: A true rich red chainette (matches our Red chainette) with matching red sequins. Royal Navy with Royal Sequins: This fringe is a bright navy with beautiful and sparkling royal blue sequins. Silver Grey with Silver Sequins: Stunning silver gray chainette embellished with iridescent silver sequins. Truly elegant! Turquoise with Teal Sequins: This is a rich turquoise blue fringe trim with gorgeous teal sequins. White with Iridescent Sequins: A perfect white chainette that sparkles beautifully with iridescent sequins. Yellow with Iridescent Sequins: A true yellow chainette with perfect iridescent sequins. Metallic Black: Deep black with a rich black metallic sheen. Metallic Blue: A rich royal blue metallic fringe. Metallic Gold: A stunning and elegant gold metallic chainette. Metallic Green: A rich deep green metallic chainette. Metallic Fuchsia: A rich fuchsia pink metallic fringe. Metallic Light Pink: A soft silvery pink metallic chainette. Metallic Lime: A true lime green metallic fringe trim. Metallic Orange: A beautiful shade of orange metallic fringe. Metallic Mardi Gras: A fringe in the colors of Mardi Gras; Purple, Green & Gold. Metallic Patriotic: A 4th of July fringe in Red, White (silver) & Blue. Metallic Purple: A rich purple metallic chainette fringe. Metallic Silver: Stunning silver metallic fringe trim. Metallic Red: A metallic chainette in a true red. Chainette fringe has become very popular, not only for Home Decor, but also on the red carpet and in dance competitions. Chainette is ideal for adding drama to both costumes and clothing. Chainette fringe can be used for belly dance costumes, hip sashes, ice skating outfits, performance outfits, dance fringe, flapper dress (think The Great Gatsby! ), furniture trim, footstool fringe, crafts, costuming, shawl fringe, ballroom gowns, skirts, tiered fringe dresses, tango outfits, cheerleader uniforms, band uniforms, banners, flags, residential window treatments and drapery embellishments, valance trim, pillow details, throws, garments, dresses, dance costumes, tablecloth edging, table runners, vintage victorian projects, lampshade fringe and purse embellishment. If you are attaching your chainette trim to a stretchy fabric, or to the leg or arm opening that has elastic, simply have the person wearing the outfit put it on and pin the chainette to the opening edge every inch or so, while it is stretched to the dimension it will be when wearing. Then, after the garment is taken off (carefully because the pins are still in it), the fabric will gather the chainette fringe. The pins will help to hold the chainette evenly so that you can evenly gather it when sewing. All you need to do is gently stretch the fabric between the pins so that it is the same length as the chainette fringe and sew the chainette onto the stretched fabric. You can either machine sew, hand sew or even glue your chainette trim, depending on your project. Your chainette fringe will arrive with a thread along the bottom. This thread keeps the fringe in place during shipping and sewing. We recommend that you leave the thread in place while sewing or gluing your chainette project. After completion, the thread is easily removed from the bottom of the trim. "Decorating Studio tops the list of popular home decorating, chainette fringe, interior design, event and wedding decorations & home improvement sites because you always come first! We have Home decor, rhinestone trim, home decorating tips for events, receptions and weddings, home decorating guides, home decorating ideas and home furniture and decor. Do you want to be a decorator or interior designer? We have a complete list of Interior design and decorating schools, colleges and universities by state."